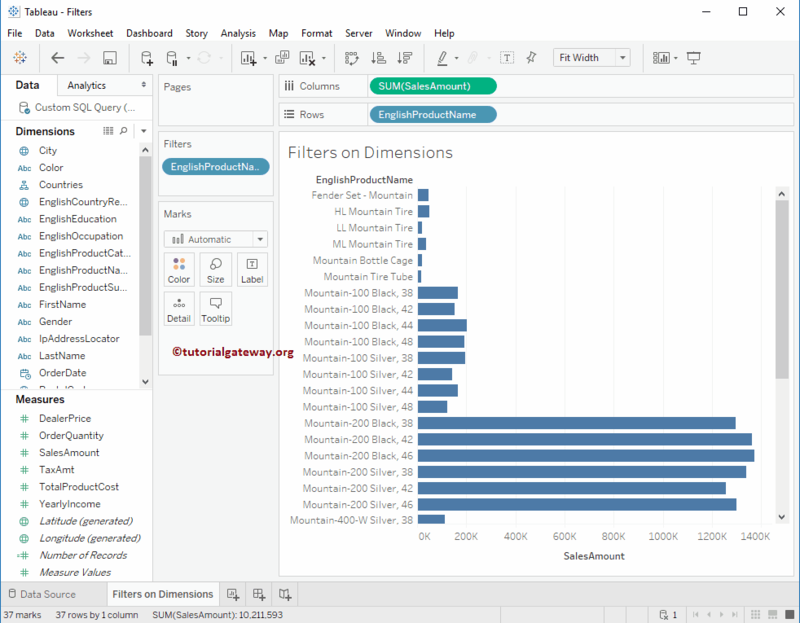 In this article, we will show you, How to create Tableau filters on Dimensions with example?. 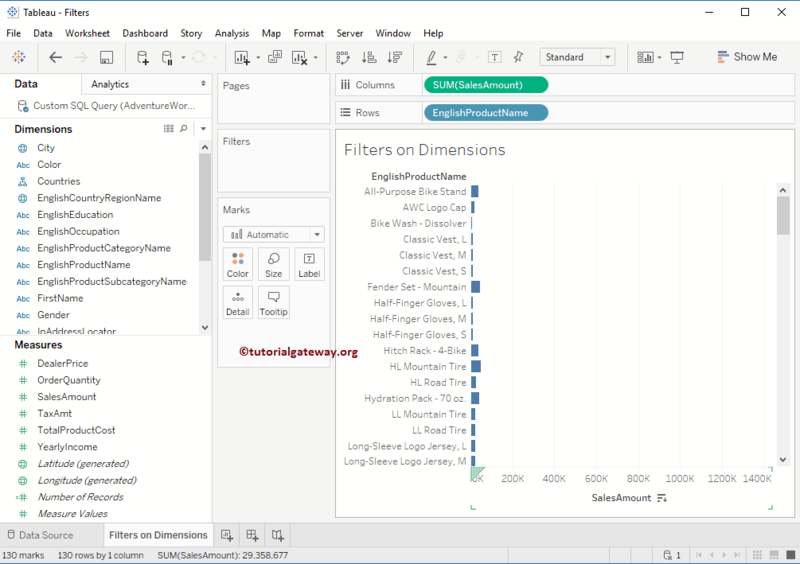 Before getting into this, Please refer Tableau Filters to understand the basic filter techniques. For this, we are going to use the data source that we created in our previous article. 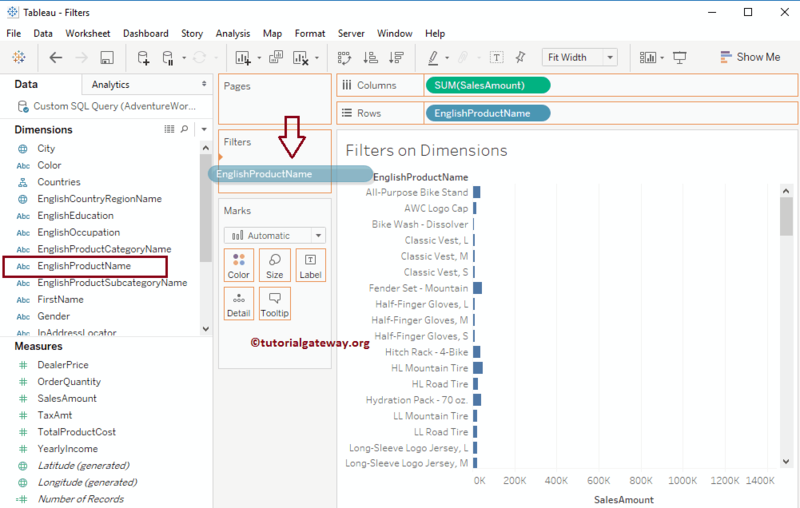 So, Please refer Data Labels in Tableau Reports article to understand the Data Source. 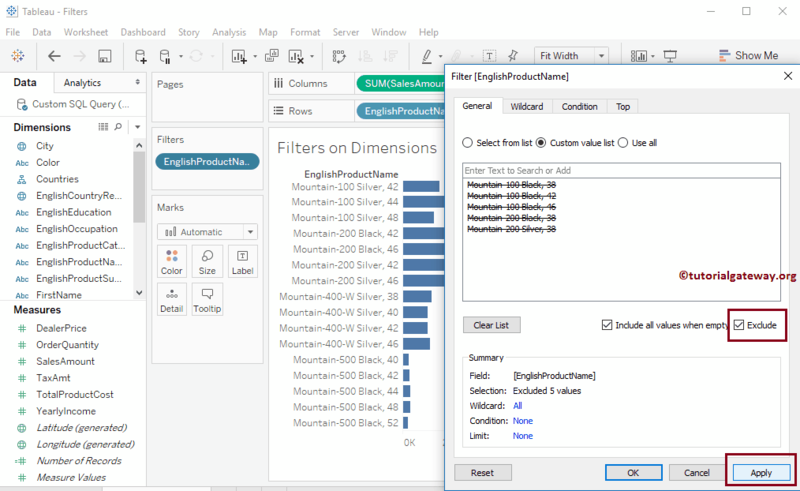 In this example, we are going to add filter condition on Product Name. 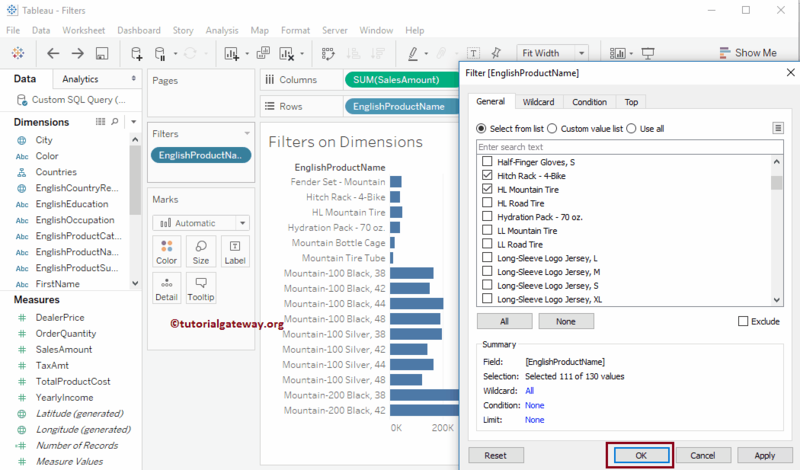 First, Please drag and drop the Product Name from Dimension Region to Filters Shelf as shown below. 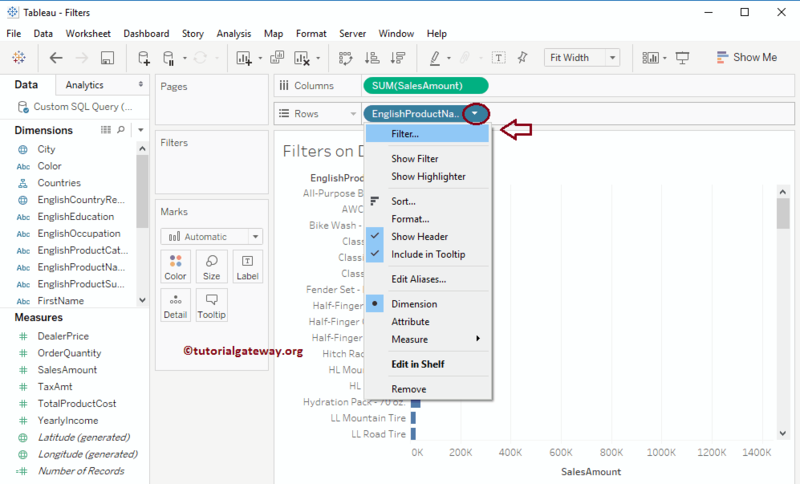 Once you drop the Product Name to Filters Shelf, a new window called Filter will be opened as shown below. This window has four tabs: General, Wildcard, Condition, and Top. 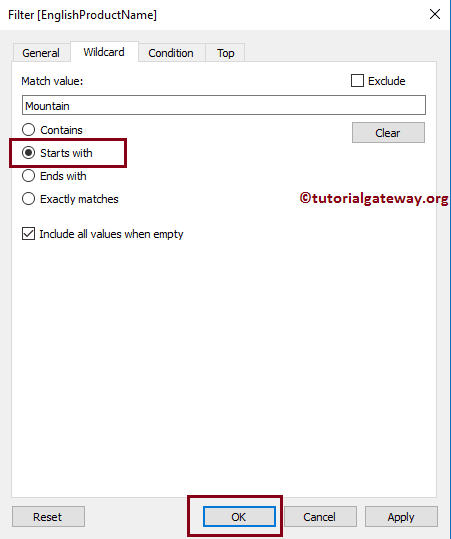 In this article, we will explain the first two tabs and basic conditions. Remaining two will be explained in separate articles. 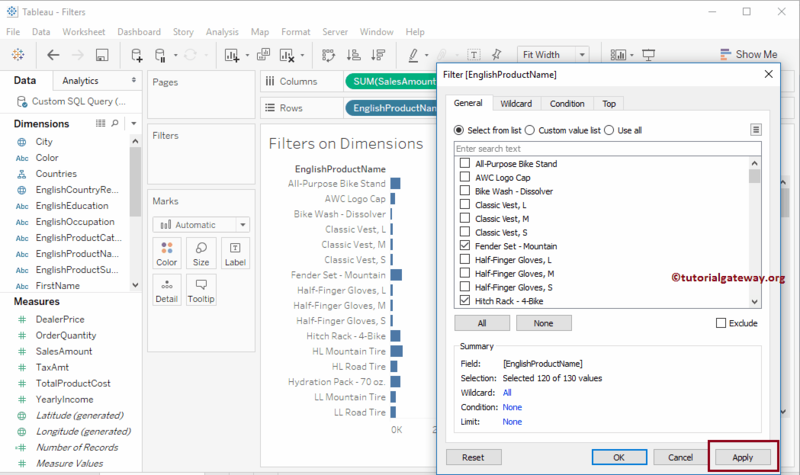 In this example, we are going to add filter condition on English Product Name. 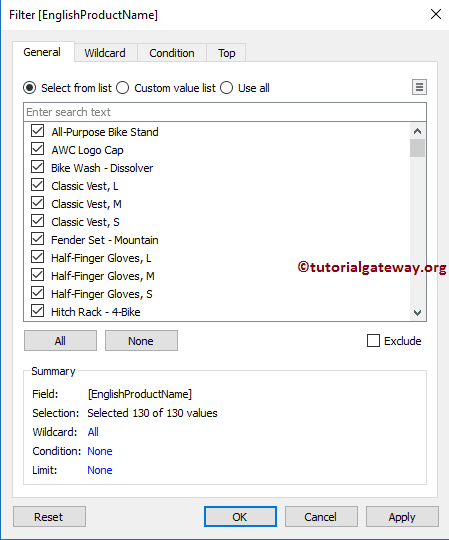 First, Please click on the down arrow beside the Product Name present in the Row Shelf will open the menu as shown below. Here, you have to select the Filter.. option. Once you select the Filter.. option, a new window is opened to create a filter. Select from the List: By default, this radio button is selected. 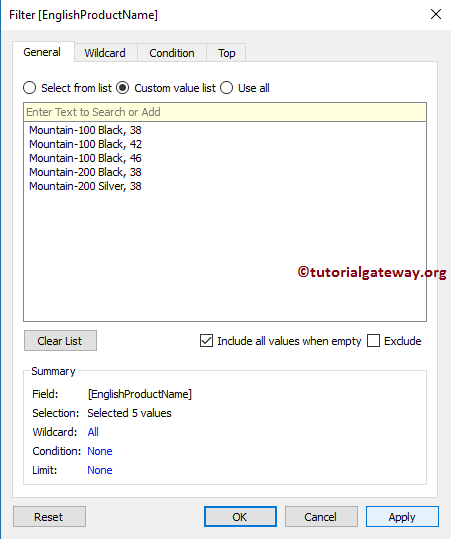 When this property is selected, it displays all the records (rows) present in that dimension (Product Name). 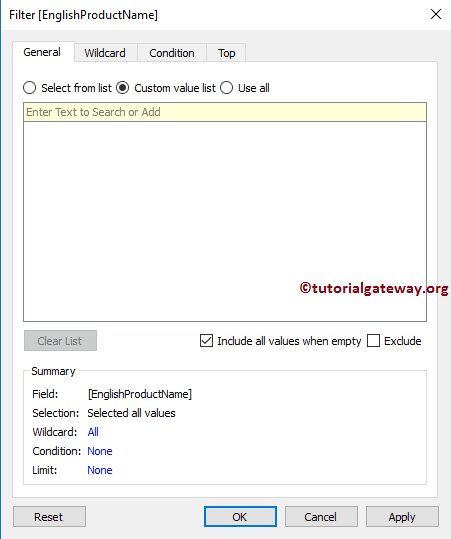 Custom Value List: Here you can write the custom values. Use All: This option is to select all the records. There is nothing to do here. All: This button will select all the records present in this window. None: This button will DE-select all the records present in this window. 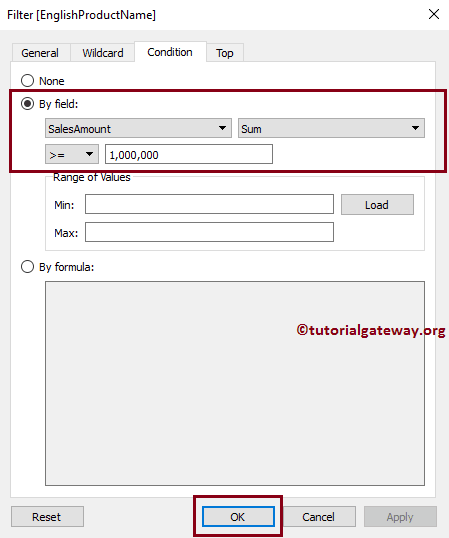 Exclude: If you check mark this option then tableau will exclude all the records that you selected here. For the demonstration purpose, we unchecked a few random records and clicked the Apply button. 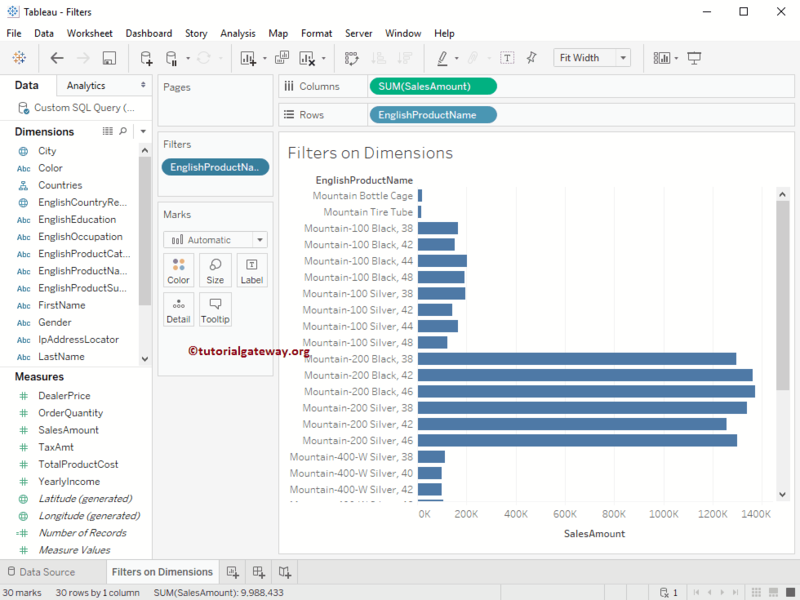 Here, Apply button will automatically reflect the tableau report without closing the Filter window. From the below screenshot you can see that the previously unchecked records are not displaying the report. Let me unchecked a few more records and click OK to apply the changes and to close the window. 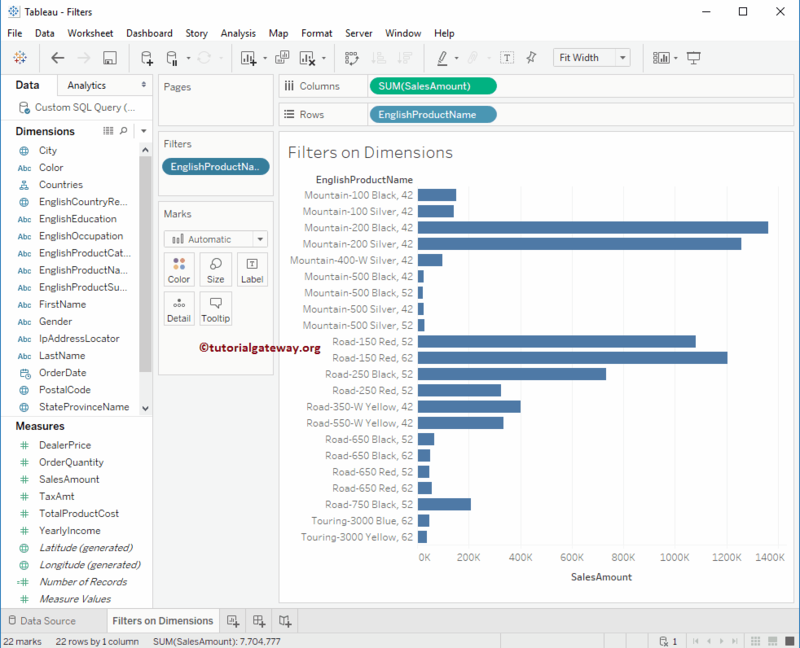 Now you can see the filters applied bar chart. 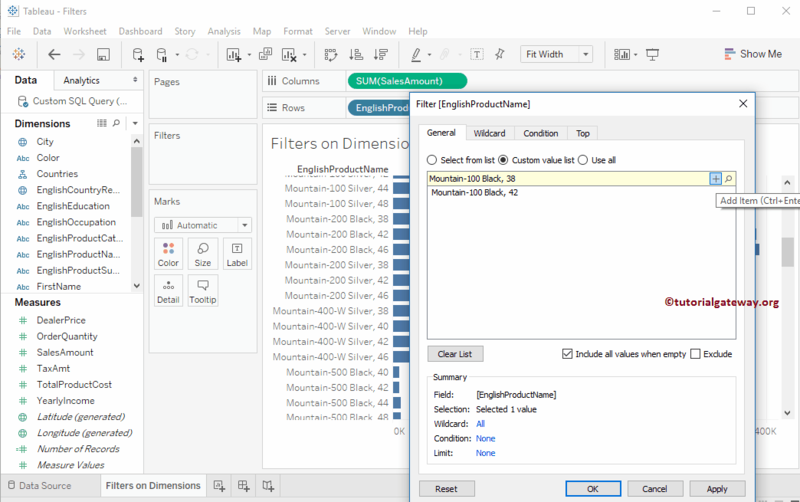 And the best part is, English product Name dimension has appeared at Filters Shelf. 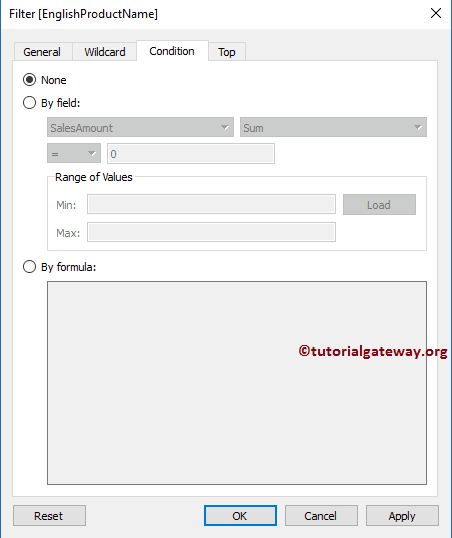 By selecting this radio button, an empty text box will be displayed to search or add text. 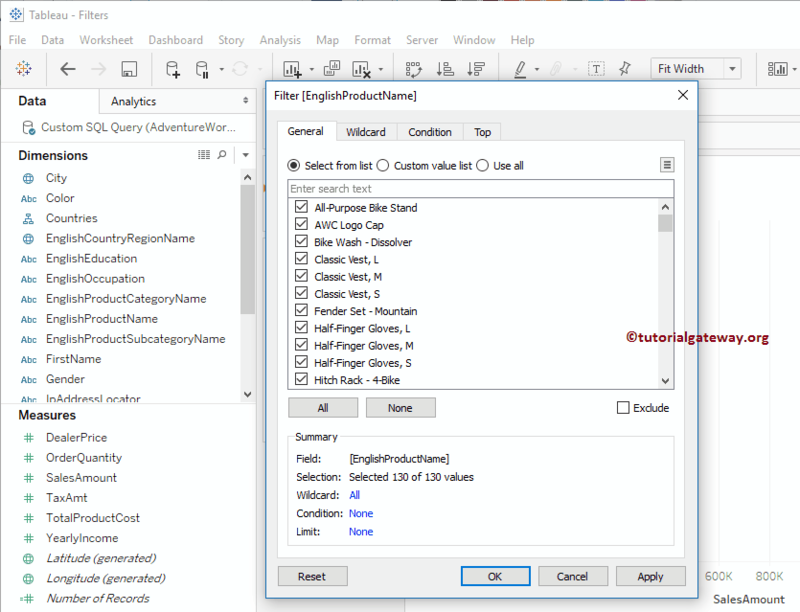 Filter conditions will apply to the data that we add here. From the below screenshot you can observe that we added two records. Let me add a few more records to this custom list. Once you are done, click Apply, and then click OK button to apply the changes and close the window. Now you can see that tableau report is displaying four records that we added to the customs value list. 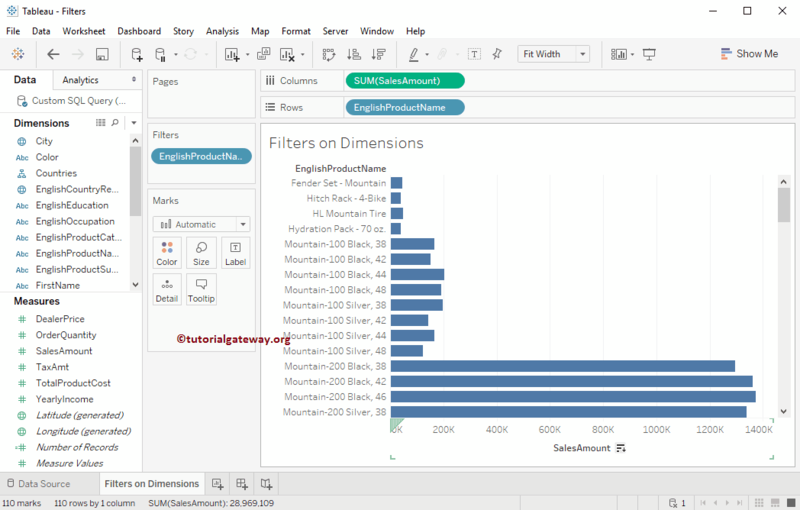 It means, tableau will display all the records in the English Product Name dimension except those four records. 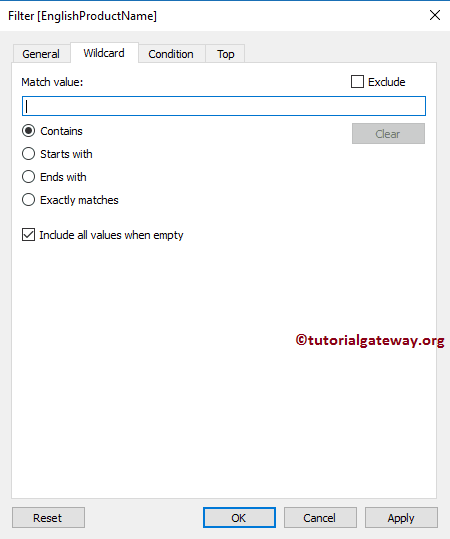 Match Value: Enter the Text, Value that you want to use in the Wildcard search. Contains: By default this radio button is selected. When this property is selected, it will check each record against the Match Value. And if it contains the match value at any position then, the record will be displayed otherwise, it will ignore that record. Starts With: It will check each record against the Match Value. And if the record starts with the match value then, the record will be displayed otherwise, it will ignore that record. 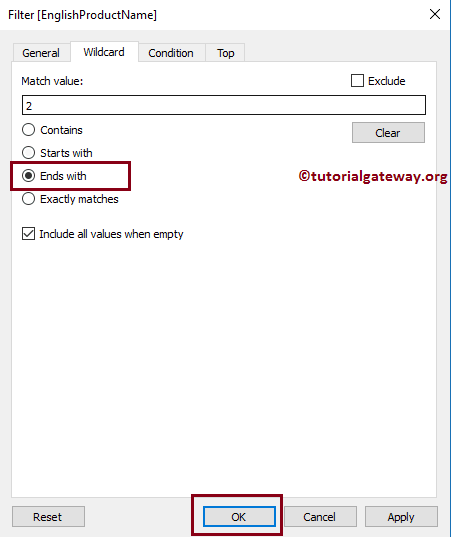 Ends With: If the record ends with the match value then, the record will be displayed otherwise, it will ignore that record. Exactly Matches: It will check each record against the Match Value. And if the record matches exactly with the match value then, the record will be displayed otherwise, it will ignore that record. 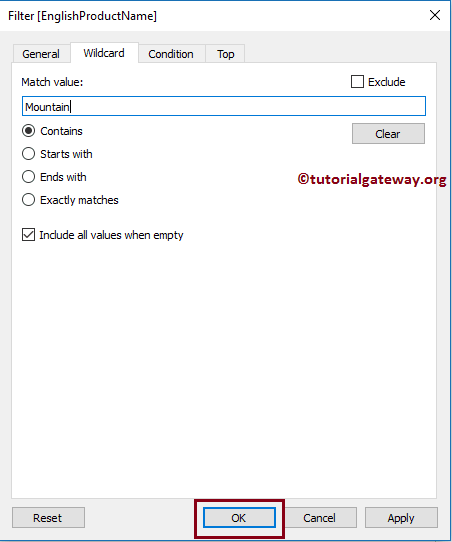 For the demonstration purpose, we are using the Mountain keyword. 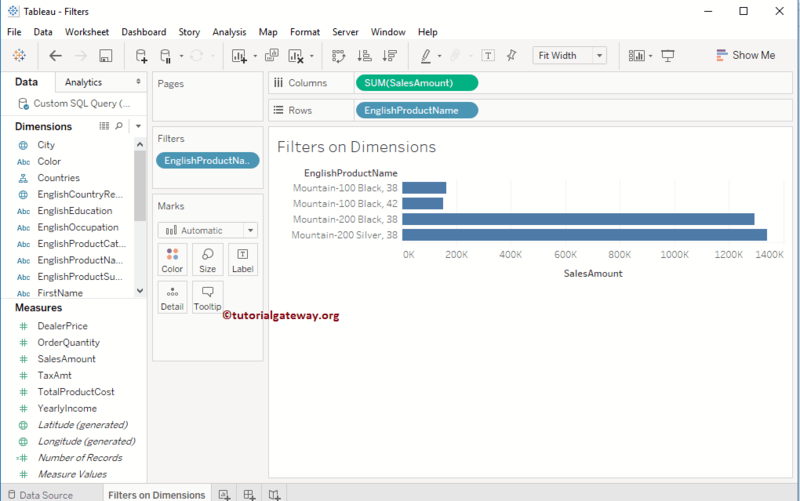 From the below screenshot you can observe that tableau report is displaying all the records that contain the Mountain keyword. 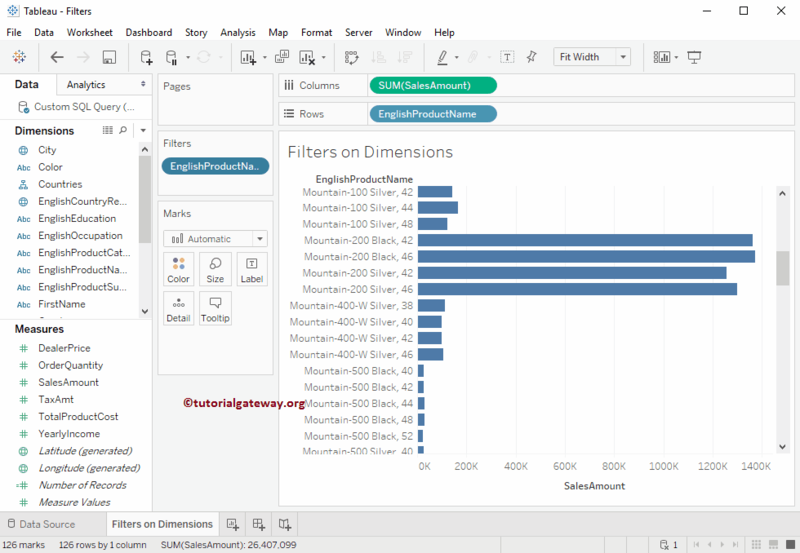 Now, our report is displaying all the records in the English Product Nam,e dimension whose name starts with the Mountain keyword. Let me change the option from Stats with to End with, and change the Match value from Mountain to integer 2. 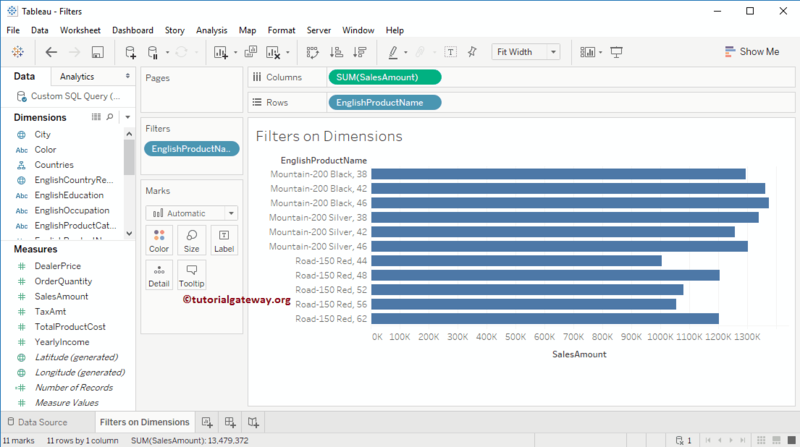 Now, our report is displaying all the records in the English Product Name dimension whose name ends with integer 2. We will explain all the option in the next article, and consider this section as the introduction to our next article. From the below screenshot you can observe that we are selecting the By filed section. Next, we selected the Sales Amount as the condition and used the >= operator. And lastly, we added 1,000,000 value in the text box. Below report is displaying all the records whose SUM(Sales Amount) is greater than or equal to 1,000,000.